Figure 3.43. Another infant with the femoral hypoplasia-unusual facies syndrome. Note the small stature, predominantly the result of the small lower limbs. Figure 3.44. 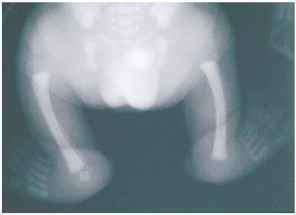 Close-up of the lower extremities of the same infant showing the absence of the femora. Figure 3.45. Posterior view of the lower extremities of die same infant. Figure 3.46. Radiograph of the lower extremities of the same infant showing the absence of femora bilaterally, a hypoplastic fibula on the right and an absent fibula on the left. In these infants, the acetabula may be hypoplastic and there may be a constricted iliac base with a vertical ischial axis. Figure 3.47. Another case of the femoral hypoplasia-unusual facies syndrome. Note the typical appearance of the face with the upslanting palpebral fissures, the short nose with hypoplastic alae nasi, long philtrum and micrognathia which was due to marked hypoplasia of the mandible. 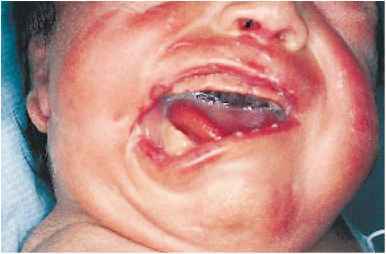 This infant also had a cleft palate which may be a part of this syndrome. Figure 3.49. Radiograph of die same infant. The wings of the ilia are slenderized, the acetabular cavities are very shallow and ill formed, and there is bilateral dislocation of the hips. There are symmetric angular deformities in the midshafts of both femora which are shortened in length. Figure 3.50. This infant, born at 35 weeks gestation, had Fraser's syndrome (cryptophthalmos syndrome). Note the cryptophthalmos on the left and the microphthalmia on the right. The infant had a cleft lip on the left and a high arched palate. There was subglottic tracheal obstruction. In Fraser's syndrome there is cryp-tophthalmos usually with a defect of the eye, and hair growth on the lateral forehead extends to the lateral eyebrow. Cryptophthalmos is bilateral in 50% of cases. There may be hypoplastic, notched nares and a broad nose with a depressed bridge. 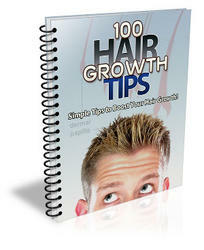 There are ear anomalies, most commonly cupping. Other findings in the syndrome include laryngeal stenosis or atresia, renal agenesis, and incomplete development of the male or female genitalia. There may be partial cutaneous syndactyly. Figure 3.51. In this figure of the same infant, note the abnormal ears with marked cupping. Figure 3.52. 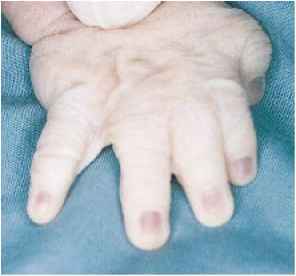 Cutaneous syndactyly (webbing) of the fingers is present in the same infant. Figure 3.53. The same infant with Fraser's syndrome showing the webbing of the toes. Figure 3.54. Clitoromegaly in the same infant with Fraser's syndrome. The uterus and ovaries were present on ultrasound and there was bilateral renal agenesis. Figure 3.55. Freeman-Sheldon syndrome ("whistling face" syndrome or cranio-car-potarsal dystrophy) is an autosomal dominant condition. Note the full forehead and mask-like facies with a small mouth giving a "whistling face" appearance. There is a broad nasal bridge with deep set eyes and blepharophimosis. The nose is small with hypoplastic alae nasi and a long philtrum. Note the H-shaped cutaneous dimpling on the chin and there may be a high palate and small tongue. These infants may have failure to thrive due to swallowing difficulties, but intelligence is in the normal range. Figure 3.56. 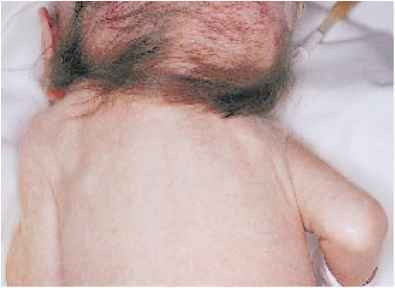 The upper extremity of the same infant with the Freeman-Sheldon syndrome. Note the ulnar deviation of the hand and contracted fingers. Figure 3.57. In this figure of the same infant, note the contractures of the toes. Talipes equinovarus may be present. Figure 3.58. Goldenhar's syndrome (facio-auriculovertebral spectrum; oculoauriculoverte-bral dysplasia) is associated with abnormalities of the first and second branchial arches. 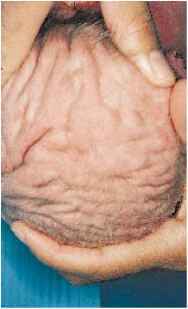 This infant shows the antimongoloid slant, bilateral macrostomia, and skin tags. Over 90% of these infants have ear abnormalities (small or unusually shaped ears, preauricular tags, and pits). They may have abnormalities of the cervical vertebrae, particularly hemivertebra, coloboma of the upper eyelids, and epibulbar dermoids. Congenital heart disease may be present in one-third of these infants. More than 80% of the infants have normal intelligence. Figure 3.59. Another infant with Goldenhar's syndrome showing the abnormal ear and preauricular skin tags in a line extending from the ear to the macrostomic mouth. Characteristic of Goldenhar's syndrome is the combination of unilateral facial hypoplasia, epibulbar dermoid, ocular abnormalities, preauricular appendages, and unilateral dysplasia of the auricle. Figure 3.60. 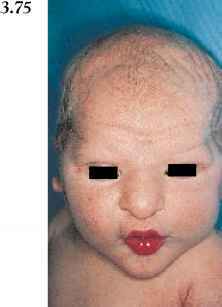 This infant is another example of Goldenhar's syndrome. She has macrostomia with a unilateral right facial cleft. In addition, there were ear epibulbar dermoids, and cardiac and vertebral abnormalities. Figure 3.61. This composite figure of the same infant as in Figure 3.60 shows the abnormalities of the ears with preauricular tags and epibulbar dermoids. Figure 3.62. 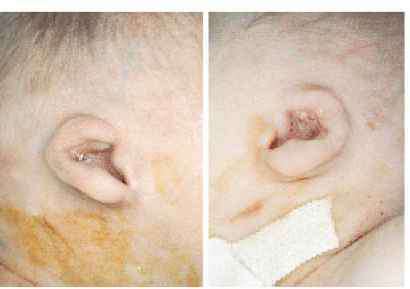 Another infant with Goldenhar's syndrome showing the lateral facial cleft, abnormal ear, preauricular skin tag, and abnormal skin from the corner of the mouth to the ear due to lack of normal fusion during development of the face. Figure 3.64. Infants with Hallermann-Streiff syndrome (oculomandibulofacial syndrome, François dyscephaly) have proportionate dwarfism. They also have brachycephaly with frontal and parietal bossing; hypotrichosis is present and the face appears small in relation to the skull. An antimongoloid slant of the eyes is common, and there is a narrow beaked nose and a hypoplastic mandible which gives the face a somewhat bird-like appearance. The mouth is small and there may be natal or supernumerary teeth. These infants often have bilateral congenital cataracts. Figure 3.65. A lateral view of die same infant. Note the brachycephalic skull, small nose, micrognathia, and marked hypotrichosis. These infants have normal intelligence. Figure 3.66. In this figure note the antimongoloid slant of the eyes, narrow beaked nose, small pinched mouth, micrognathia, hypoplastic mandible and hypotrichosis. Figure 3.67. In this figure of the same infant as in Figure 3.66 note the high arched palate. Figure 3.68. Infants with the Klippel-Feil syndrome or anomaly have a head which appears to be directly on the thorax. The facies is distorted and the ears are low set. Fusion or malformation of the cervical and upper thoracic vertebrae produces the short neck with head tilt and low posterior hairline. Strabismus is common. Figure 3.69. 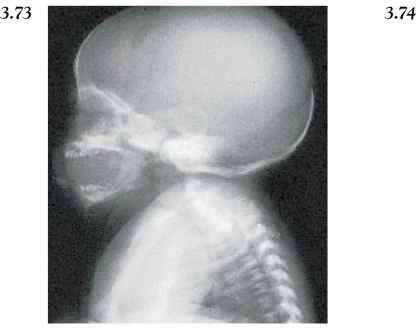 Posterior view of the same infant showing the short neck (congenital brevicollis) and the low hairline. Figure 3.70. 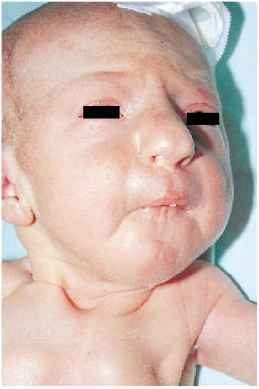 A lateral view of the face, neck and chest of another infant with Klippel-Feil syndrome. Note the extremely short neck with low hairline and very abnormal ear. Figure 3.71. 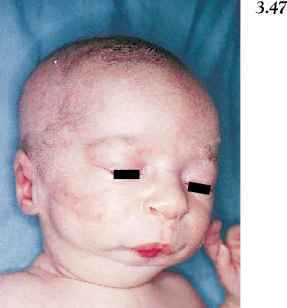 In this infant with the Klippel-Feil syndrome note the abnormal ear and short neck on the left. 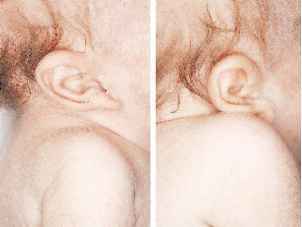 On the right, note that the abnormality of the ear results from pressure of the shoulder on the developing ear — a deformation. Figure 3.72. 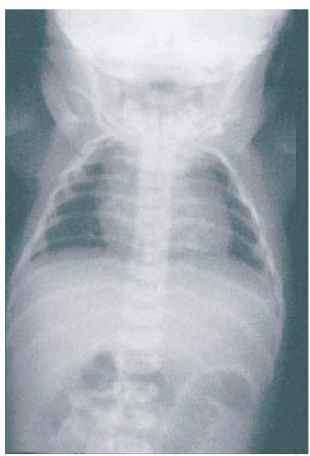 Anteroposterior radiograph of an infant with Klippel-Feil syndrome showing the numerous cervical spine vertebral body anomalies. Figure 3.73. Lateral radiograph of the same infant as in Figure 3.72 with Klippel-Feil syndrome again shows cervical vertebrael anomalies resulting from abnormal fusion of the cervical vertebrae. There may be other associated skeletal defects such as the Sprengel's deformity or thoracic hemivertebrae. If the brachial plexus is involved, it may result in deformities of the hand. Figure 3.74. Infants with the Langer-Giedion syndrome have a bulbous nose, tented alae nasi, and a prominent elongated philtrum. 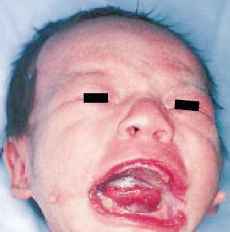 There is a thin upper lip with mild micrognathia and mild microcephaly. 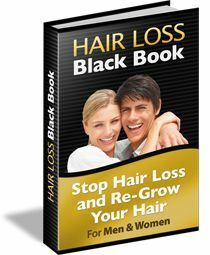 Scalp hair is sparse. The ears are hypertrophic with excessive folding and tissue mass. 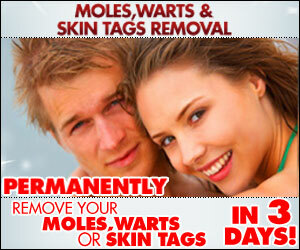 The skin is redundant and loose. 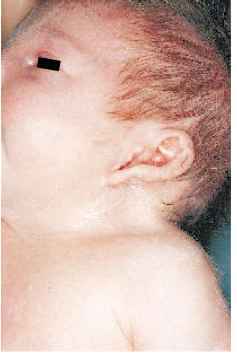 This infant, in addition to the above findings, had cutis verticis gyrata. Figure 3.75. In this figure of the same infant again note the bulbous nose, thin upper lip on the left and the cutis verticis gyrata on the right. The tri-chorhinophalangeal syndrome has many similarities to Langer-Giedion syndrome except that the redundant skin and microcephaly are not present. Figure 3.76. Close-up of the ears of the same infant showing the hypertrophy with excessive folding and tissue mass. Figure 3.77. The same infant had large vertical creases on both plantar surfaces anteriorly. These are strongly associated with trisomy 8. The Langer-Giedion syndrome recently has been associated with a deletion of the long arm of chromosome 8. Figure 3.78. 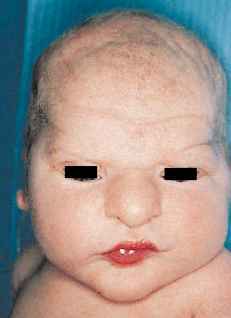 This infant with Larsen's syndrome demonstrates the prominent forehead, depressed nasal bridge, and dislocation of the elbows on the left. On the right there is dislocation of die hips, knees, and talipes equinovarus.